On june 1rst 2016 the Danish state radio today played a quite new tune. Suddenly they have become wind turbine (wt) CRITICAL. It is because a scandalous planning “failure” over 10 years in the poor Tucana lake and rural area in Kenya, where “they” have planned to erect 350 big wt’s, and where Vestas has played a central role. The company DanWatch (Copenhagen) has published a report (see below) to support the poor local Kenyan population who in these days start court cases towards the state of Kenya and the international consortium of wt owners/planners etc. , including Vestas. About a year ago there was also a shooting to death of teen on another Kenyan wt project which documented the brutality used by the wt “developers”. These shooting “episodes” have taken place in other countries (Mexico e.g.). “Care Danmarks ” Kenyan coordinator – was interview today in P1 Radio, local time about 8:05 AM for about 10 minutes (in Danish) where she presented the latest Vestas scandal, related to a huge , more than 10 years lasting multibillion Euro wt project. The report (link below) showed that nearly non contacts had been taken or information submitted to the local population – not the poor peasants, not the power elite. Vindturbinerne fra danske Vestas er begyndt at ankomme i området ved Lake Turkana i det nordlige Kenya, hvor Afrikas største vindmøllepark skal anlægges. Men utilfredsheden blandt de lokale bobler og der er anklager om jordtyveri. En kritisk rapport fra Danwatch sår tvivl om lovligheden bag storstilet afrikansk vindprojekt, hvor både Vestas, IFU og EKF er involveret. As wind turbines begin to arrive in Kenya by the hundreds, a court case about illegal land acquisition in Northern Kenya drags on between nomadic tribes, an international consortium and the government, while tensions are on the rise in local communities. Danwatch visited Northern Kenya to get a closer look at the impacts of Kenya’s largest-ever private investment. The room was filled to capacity as traditional nomads, lawyers and representatives met at the Land and Environment Court in Meru, March 9. Once again, Judge Peter Njoroge announced a postponement of his decision in a dispute about alleged illegal land acquisition between representatives from local communities and an international million-euro consortium, Lake Turkana Wind Power project. A high profile case which may have serious long-term consequences for Kenya. The Lake Turkana Wind Power project represents a revolution for renewable energy in Kenya – but in its home region in Northern Kenya, the project is facing obstacles. First of all, the legality of how the consortium acquired the land in 2006/2007 is questioned, second the project has now caused inter-tribal conflicts, and finally, critique of the power purchase agreement (PPA) with the government has been raised. Lake Turkana Wind Power project is Kenya’s biggest private investment ever at a value of approximately 620 million euros. Electricity from the turbines will increase Kenya’s energy output by between 15-20%, and according to the project’s own calculations, the turbines will bring electricity to 2,5 million additional Kenyans. 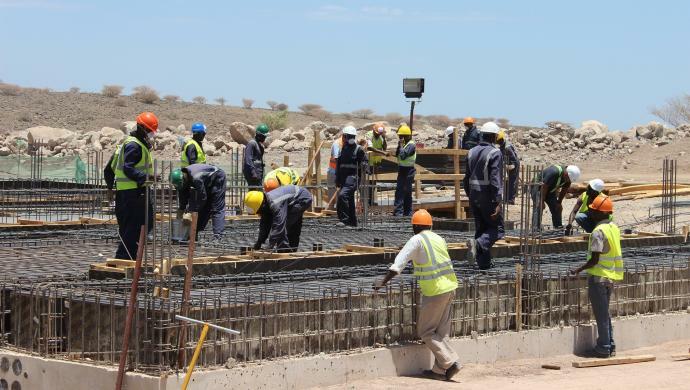 Since its inception in 2006, the consortium has leased 150,000 acres of land and resettled a small village, Sarima, in order to build a road and set up 365 wind turbines alongside the windy shores of Lake Turkana. In 2014, the project faced headwind when residents from Laisamis Constituency and Karare Ward filed a lawsuit, not only against Lake Turkana Wind Power project, but also the county government, the National Government and the National Land Commission for illegal land acquisition. the complete, critical report – in English – made by DanWatch. 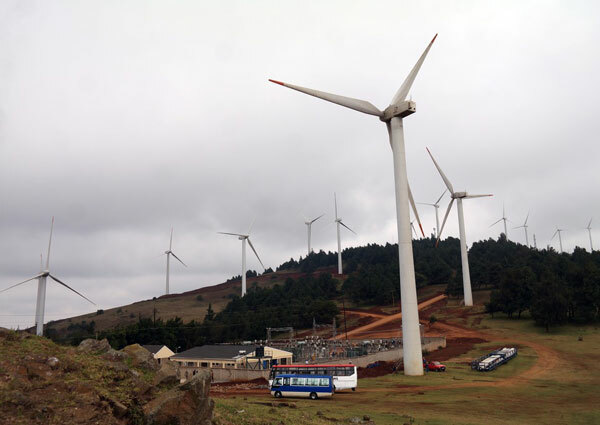 The company putting up a wind-power plant in Nyandarua has expressed its regrets over the death of a teenager following protests over the implementation of the Sh13 billion project. Kinangop Wind Park chief Executive officer James Wakaba termed the shooting as regrettable adding that they were monitoring the situation and would make their position clear after today’s meeting between the local leaders. The teenager was reportedly shot as protesters stormed Magumu Police Post in an attempt to free nine of their colleagues who were arrested on Tuesday morning by the police on incitement charges. Mr Wakaba said it was “in the company’s best interest” to undertake the project in a peaceful atmosphere, devoid of any protests by the community and the Persons affected by the Project. “After the meeting by the local politicians and the community representatives we will advise the investor accordingly,” said the CEO. He said the firm had carried out a comprehensive sensitisation campaign and addressed major concerns by the public, before deciding to go ahead with the implementation programme. Mr Wakaba dispelled fears that the project was a health hazard, saying they had adopted “world accepted standards,” when coming up with the project. “The fears expressed by the residents are unwarranted. This is the cleanest form of energy,” he added. Meanwhile, a family whose land the firm will set up a turbine has claimed that they had not been party to the talks, despite being among those affected by the project. “One of the turbines is set to be erected on our farm, but we have never been approached by anyone,” claimed the family members. The family called for thorough vetting of all claimants alleging that some of those listed as affected persons were actually “masqueraders” adding that it had delayed compensation of all affected persons.